Our famous Bundaberg Ginger Beer is craft brewed from our genuine family recipe that’s been handed down from generation to generation; it’s the jewel in the crown at Bundaberg Brewed Drinks. And you can really taste the brewed difference. Made with the finest, Australian grown ginger and sugar cane, there’s simply no compromise in ingredients or quality. It’s the real deal! That’s why it takes our expert brewers up to three days to brew every batch, ensuring maximum flavor in every bottle. And what a bottle it is! In the classic Bundaberg shape, topped with the iconic rip cap, make sure you Flip, before you Rip and Sip (before you pop one open, hold it upside down and you can actually see the real brewed ginger pieces forming a flavor-filled cloud). 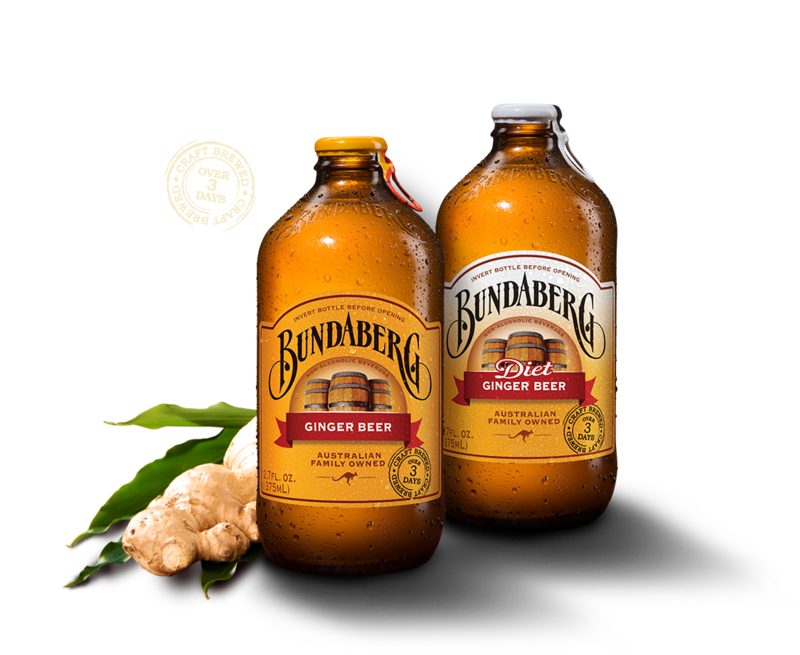 Bundaberg Diet Ginger Beer offers the same great taste, with fewer calories, as you’d expect from any drink carrying our proud name. As a close cousin to our famous Bundaberg Ginger Beer, it’s in very good company. So what’s the verdict? Your tastebuds won’t be disappointed. Ingredients: Carbonated Water, Cane Sugar, Ginger Root, Natural Flavors, Acid (Citric Acid), Yeast, Preservatives (Potassium Sorbate, Sodium Benzoate), Antioxidant (Ascorbic Acid). Ingredients: Carbonated Water, Ginger Root, Cane Sugar, Flavor, Citric Acid, Malic Acid, Preservatives(Potassium Sorbate, Sodium Benzoate), Antioxidant (Ascorbic Acid), Yeast, Aspartame, Stabilizer (Guar Gum), Acesulfame Potassium, Sucralose.